Joe Donaghey spent most of his childhood growing up in the small town of Wiarton, Ontario on the beautiful Bruce Peninsula. He was brought up in a musical family with various influences from classical to electronic music being played at any given time. 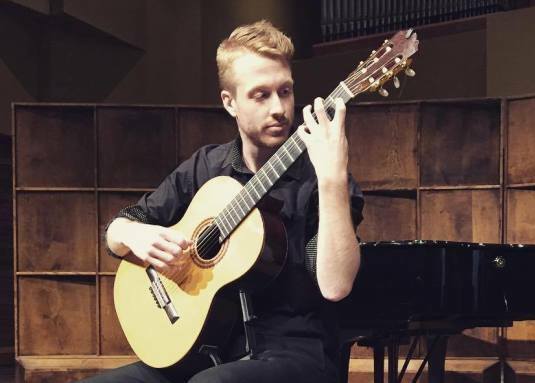 At the age of 15 Joe took up his first guitar and began creating music over the next few years until he got accepted into the performance program at Cambrian College for his advanced diploma. After graduating, Joe went straight into his bachelor’s degree at Memorial University. It was here where he continued studies with classical guitar performance and also took a degree in composition. During his studies, Joe had the opportunity to work at Dynamic Sounds Music Studio in St. John’s where he worked with children and adults as a guitar teacher. The next chapter for Joe is the move to St. Anthony and his work with the IGA. Together with the IGA, Joe will head the second phase of the music program. The first phase of this program (also initiated by the IGA) was headed by Dr. Tom Gordon from the MUN School of Music, as he worked with brass bands in Northern Labrador. Promotion and accessibility to music for everyone in town and the surrounding communities will be the main focus of this new program. There is a hope of putting together a summer music festival and a strong focus on working with schools and organizations to help music in education. Joe’s small-town upbringing, extensive background with music, and working in the community, paired with the excitement and optimistic feedback this program has garnered will lead to some great programs and opportunities in St. Anthony and area, and along the Labrador Straits. If you would like to explore ways that you or your organization can get involved in this initiative, Joe can be reached at 709-450-4487, or by email at [email protected].